LookupJoin is a general purpose joiner. It merges potentially unsorted records from one data source incoming through the single input port with another data source from a lookup table based on a common key. The joined data is then sent to the first output port. The second output port can optionally be used to capture unmatched master records. Optional output port for master data records without slave matches. (Only if the Join type attribute is set to Inner join.) This applies only to LookupJoin and DBJoin. LookupJoin propagates metadata from the first input port to the second output port and from the second output port to the first input port. The propagation does not change the priority of metadata. LookupJoin has no metadata template. Either data source (input port and lookup table) may potentially have a different metadata structure. Key according to which the incoming data flows are joined. See Join key. If set to true, also driver records without corresponding slave are parsed. Otherwise, inner join is performed. ID of the lookup table to be used as the resource of slave records. 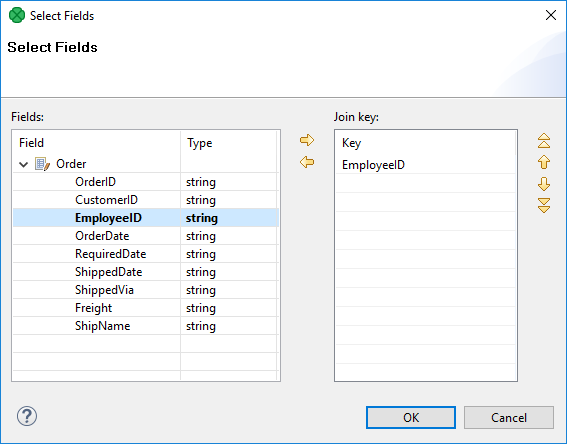 Number of lookup key fields and their data types must be the same as those of Join key. These fields values are compared and matched records are joined. Transform  Transformation in CTL or Java defined in the graph. Transform URL  External file defining the transformation in CTL or Java. Transform class  External transformation class. Encoding of the external file defining the transformation. When set to true, memory caches of the lookup table will be emptied at the end of the execution of this component. This has different effects on different lookup table types. Simple lookup table and Range lookup table will contain 0 entries after this operation. For the other lookup table types, this will only erase cached data and therefore make more memory available, but the lookup table will still contain the same entries. Definition of the action that should be performed when the specified transformation returns an Error code. See Return Values of Transformations. URL of the file to which error messages for specified Error actions should be written. If not set, they are written to Console. One of these must be set. These transformation attributes must be specified. Any of these transformation attributes must use a common CTL template for Joiners or implement a RecordTransform interface. LookupJoin is a general purpose joiner used in most common situations. It does not require the input to be sorted and is very fast as it is processed in memory. The data attached to the first input port is called the master, the second data source is called the slave. Its data is considered as if it were coming through the second (virtual) input port. Each master record is matched to the slave record on one or more fields known as the join key. The output is produced by applying a transformation which maps joined inputs to the output. Slave data is pulled out from a lookup table, so depending on the lookup table the data can be stored in the memory. This also depends on the lookup table type, e.g. Database lookup stores only the values which have already been queried. Master data is not stored in the memory. Join key is a sequence of field names from the input metadata separated by a semicolon, colon or pipe. You can define the key in the Edit key wizard. A counterpart of this Join key of the input metadata is the key of lookup table in lookup tables. It is specified in the lookup table itself. This is the master part of fields that should serve to join master records with slave records. Corresponding fields will be compared and matching values will serve to join master and slave records. If the lookup table allows key duplicates, more output records can be created from a single input record. All Joiners share the same transformation template which can be found in CTL Templates for Joiners. Given a list of number of customers for particular year per country with metadata fields CountryCode, Customers and Year. Replace the country code by country name. The list of country codes and corresponding country names is available from lookup table CountryCodeLookup. Use the attributes Join Key, Lookup Table and Transform. Transform See the code below. Values found in the lookup table are mapped in the same way as if they came from the second input port. The country code CZE has not been found in the lookup table, so it has been sent unchanged to the second output port if an edge is connected. This example shows usage of Range Lookup Table table in LookupJoin. Records on the first data stream contains groups of accounts. Each group of accounts is defined by the lowest and highest account numbers, e.g. 12300 and 12399. Data on the second data stream contains account numbers. Match the accounts with groups. 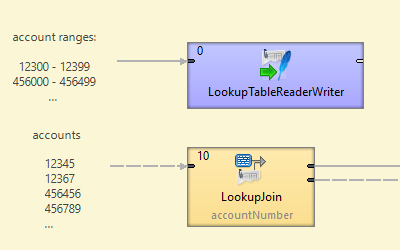 Load the records containing account ranges with LookupTableReaderWriter into Range Lookup Table. In the next phase, use LookupJoin to match the records from the second data stream. In LookupJoin set Join Key, Lookup Table, and Transform. Transform Map the fields that are necessary. Matching account into the ranges depends on the data type. If the account ranges and account number are specified as a whole number (integer/long), the records are compared as numbers. If the account ranges and account number are specified as a string, the records are compared as strings. If account numbers are integers (or longs) and the range is from 10 to 50, account 200 is out of the range. If account numbers are strings and the range is from 10 to 50, account 200 is within the range. If the transformation is specified in an external file (with Transform URL), we recommend users to explicitly specify Transform source charset.